This painting is created with a cement mixture in which I die the cement with acrylic paints and using a painting knife apply it to the board backing. One of the challenges in this medium is the wet nature of the work and trying to get the background colors in first trying to work from dark to light. Due to the high viscosity of the medium used it starts to pile up pretty quick and adding dark layers on top can give an off putting appearance when seeing the work in person. I try to use as little brushwork as possible with this medium and reserve it for detail and some highlights. 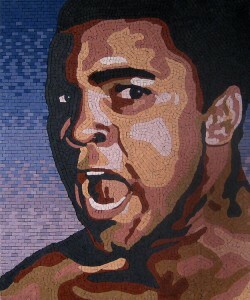 Hopefully I can locate some images of other works I have done in the past created in this medium. Clint Eastwood is in progress right now and has had a fair share of challenges along the way. 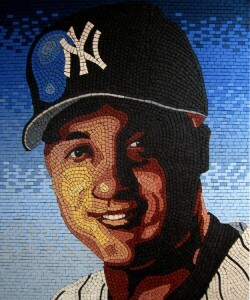 The other mosaic portraits have been done in porcelain tile which and this one I chose to do in glass. The tiles I used for this are 3/8 inch to start which I thought would lead to some time saving as I would not have to cut each and every piece. Boy was I wrong! The glass for one thing is fairly slick and it took me a while to get the knack for holding them while cutting and not having the piece I want to use fly out of my hand. Once that was solved the other dilema came when needing to cut the pieces down as the back of the tiles are beveled so to get the nippers a grip to make precise cuts was not easy. 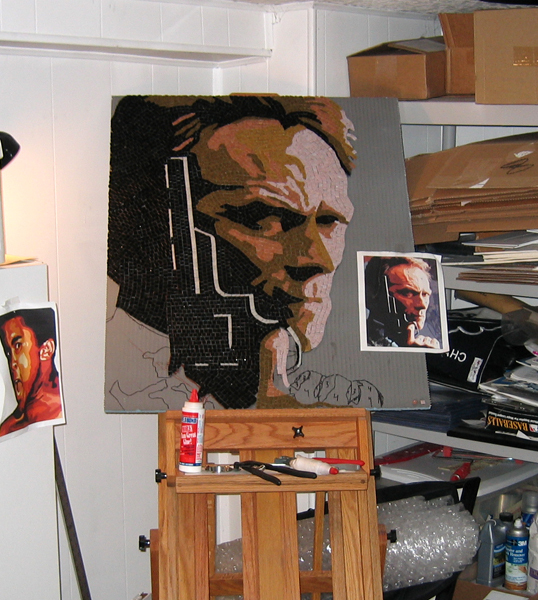 Part of the ongoing challenge is creating a likeness of the subject in a limited range of tile colors- For Clint Eastwood there was only 4 primary colors along with black and very little white for the areas on the gun. Unlike paints there is no blending and as the artist you do not get to really choose your shades to work with. Color lines are pre-set by the tile manufacturer and you try to choose a line that will give you the shades you most closely desire. The other issue is the depth and the construction of the tile itself which makes choosing tiles from different manufacturers for the same project not a realistic alternative. 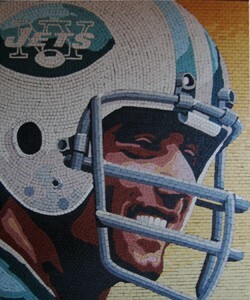 I will be posting images from this piece that I took early on in its creation so you can see some of the steps involved and at some point I would love to video the creation of one- However due to the slow nature of mosaic work we would have to condense that video down a lot-Who wants to watch a months worth of footage in real time? No one.